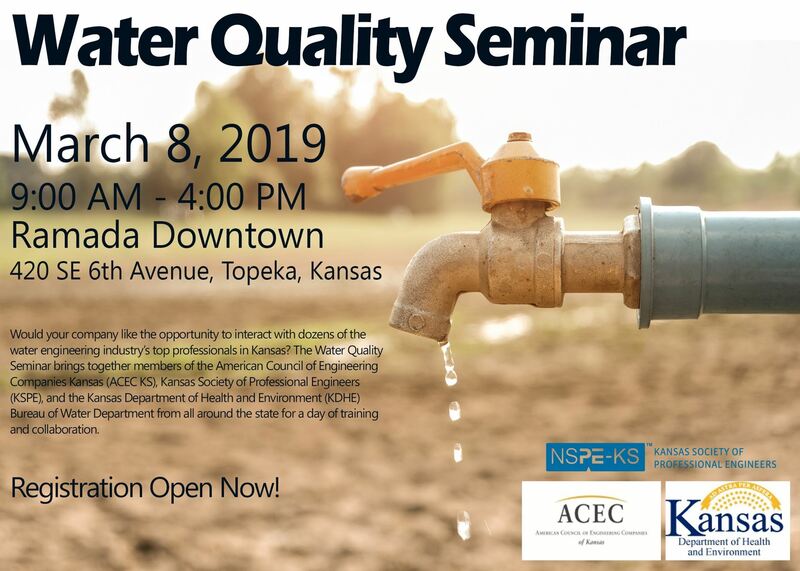 Would your company like the opportunity to interact with dozens of the water engineering industry’s top professionals in Kansas? The Water Quality Seminar brings together members of the American Council of Engineering Companies Kansas (ACEC KS), Kansas Society of Professional Engineers (KSPE), and the Kansas Department of Health and Environment (KDHE) Bureau of Water Department from all around the state for a day of training and collaboration. I am writing to offer your company the opportunity to participate in this conference as one of our featured vendors, allowing you to be seen and interact with everyone in attendance. By participating as a featured vendor in this conference, your company will receive a dedicated space to display company advertising and informational materials, an opportunity to present your services to the attendees of the event, and all the networking you can manage during this one-day event. The 2019 seminar will be held at the Ramada Downtown Topeka (Topeka, KS) on March 8, 2019. For more information on features and pricing of this opportunity, please see the attached vendor showcase registration form. Space is limited! Please send your completed vendor registration form (attached) to our office at your earliest convenience, or register online by clicking here. Payment may follow, but registration forms must be received by no later than February 22, 2019. For more information on ACEC KS, please visit www.acecks.org. For more information on KSPE, please visit www.kansasengineer.org. For more information about KDHE Bureau of Water Department, please visit www.kdheks.gov/water/.